Together with Kamstrup, Uggerly, and 9 other selected companies, Seluxit will join a series researchers in a smarthome pilot project led by the Department of Management of Aarhus University. The project aims to develop knowledge and tools to assist producers and suppliers to Smart Homes in developing digital business models, new sales and marketing strategies, management and finding a new role in a digital ecosystem. 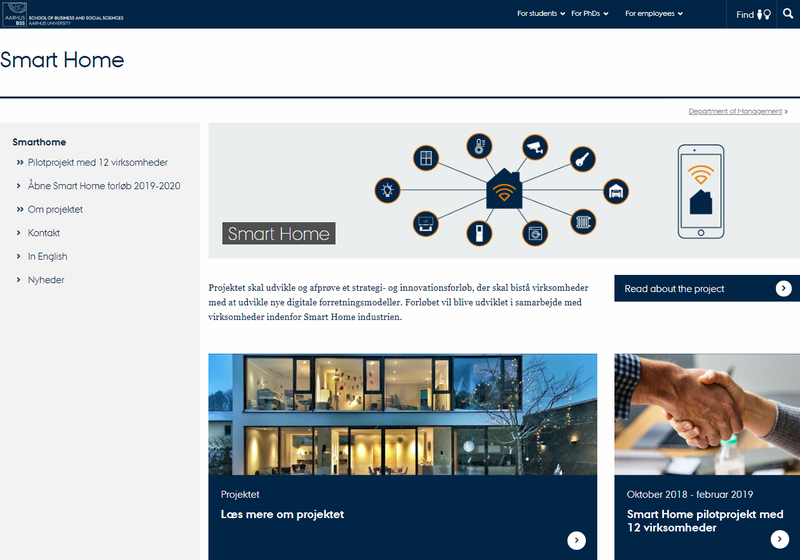 The ambition is to strengthen SMVs in the Danish building and Smart Home industries. The pilot project with the 12 participating companies will help shape a later offering with the aim to spread relevant knowledge to 100 companies. Seluxit will be participating as an expert in providing IoT solutions to companies interested in making smart home products. The project lasts from 2018 to 2020 and is supported by the Danish Industry Foundation and the Alexandra Institute. For more information, read the article on dr.dk (in Danish) or on Aarhus University's website (with a resume available in English).